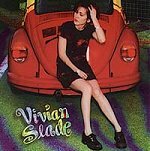 In the finest tradition of artists like Joan Osborne and various members of the Lilith Fair collective/posse/festival comes the possibly even more vital and powerful Vivian Slade. Her snide humor, insightful wisdom, and striking pathos leaves an indelible mark on the soul as well as the ears. Musically her strength lies in the snappy pop energy that she so skillfully navigates through much of the album. The first two songs are especially solid in this regard. Her more subdued moments ("Fly") are often far less effective and come across so introspective and reserved that they seem guarded. As the cd progresses Slade becomes more adventurous with her sound experimenting with various flavored ballads, blues ("The Way To Go") and even a touch of ethnic Spanish sounds ("Don't Know Why"). The diversity is impressive for both its breadth and depth and allows her to explore emotionally, lyrically, and musically. Once in awhile her guard goes up and I don't feel welcome (at best) or like I'm intruding (at worst), but maybe that is just a natural by product of approaching an inherently feminine perspective from my male frame of reference. In spite of these lapses this is an artist worth watching in the future.